Millwork Software That Works Like You Work. Millwork Software That Works Like Do. Not all ‘manufacturing’ software is equal. Building materials and millwork dealers want to streamline production, track manufacturing costs with up-to-the-minute information on orders throughout the production process, and maximize margins on everything they sell. Only Ponderosa from CAI Software offers the full range of on-demand millwork applications they need. Ponderosa’s intuitive Millwork Product Configurator (ProCon) is best-in-class and lets you quickly price, cost and set-up millwork units, including Special Order items, without the hassle of maintaining numerous, cumbersome Bill of Materials or kits. With other ‘millwork’ solutions, if a single component, like a hinge changes, the entire kit must be manually updated, re-costed and repriced, wasting time and money and resulting in possible errors. Moreover, if your production is not tightly integrated with your ERP system, you’re leaking money every day. The integration of the Ponderosa POS, Warehouse Management, Delivery, Installed Sales, and Back Office apps can turn your millwork business into a well-oiled machine. 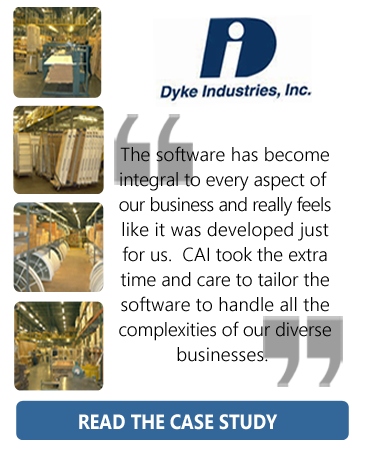 Track the Manufacturing of Built-up Millwork Units. Ponderosa lets you easily define and track the production of built-up interior and exterior doors, window units, stair systems, and any other manufactured building material so you always know your cost of production and true margins. Ponderosa can streamline manufacturing processes, reducing manufacturing time by as much as 30% and helping you continually meet committed delivery dates to cement loyalty. Ponderosa’s convenient web-based Sales Portal lets your customer buy 24/7 and helps to eliminate costly returns and rebuilds. The software’s Configure, Price and Quote (CPQ) tool presents possible selections for entry and interior door systems, windows, and other millwork products as high-resolution images. If someone is interested in a custom entry door, they simply select, view and price their desired door slab type, sidelights, transom, exterior trim and other options to fit their project. Choices are quick and logical with only logical, compatible components presented, eliminating the potential of costly returns and rebuilds. Whether you’re a one-step millwork business that sells primarily to builders and contractors or a two-step distributor servicing mostly dealers and retailers, Ponderosa will give you better control of your business and help you reduce operating costs. Why settle for a one-size-fits-all solution. Call Dennis Sullivan at (800) 422-4782 or email dsullivan@caisoft.com.